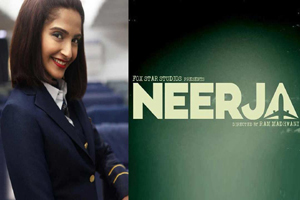 Neerja is a 2016 Indian biographical film directed by Ram Madhvani and produced by Atul Kasbekar under the banner of Fox Star Studios. Film features Sonam Kapoor in lead role and Shabana Azmi and Shekhar Ravjiani in supporting roles. The film is based on the life of Neerja Bhanot who was shot dead by terrorists who hijacked Pan Am Flight 73 in Karachi on 5 September 1986. The music for the film has been composed by Vishal Khurana and the lyrics have been penned by Prasoon Joshi. Here is the link of all the songs lyrics and videos of Neerja.